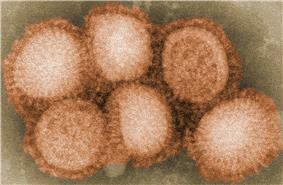 H5N2 is a subtype of the species Influenzavirus A (avian influenza virus or bird flu virus). The subtype infects a wide variety of birds, including chickens, ducks, turkeys, falcons, and ostriches. Affected birds usually do not appear ill, and the disease is often mild as avian influenza viral subtypes go. Some variants of the subtype are much more pathogenic than others, and outbreaks of "high-path" H5N2 result in the culling of thousands of birds in poultry farms from time to time. It appears that people who work with birds can be infected by the virus, but suffer hardly any noticeable health effects. Even people exposed to the highly pathogenic H5N2 variety that killed ostrich chicks in South Africa only seem to have developed conjunctivitis, or a perhaps a mild respiratory illness. There is no evidence of human-to-human spread of H5N2. In China, inactivated H5N2 has been effectively used as a poultry vaccine for H5N1. Low pathogenic avian influenza H5N2 virus in poultry later gained accentuated virulence in the United States  and Mexico. A highly pathogenic strain of H5N2 caused flu outbreaks with significant spread to numerous farms, resulting in great economic losses in 1983 in Pennsylvania, USA in chickens and turkeys, in 1994 in Mexico in chickens and a minor outbreak in 1997 in Italy in chickens. In February 2004, an outbreak occurred in Texas and the affected flock was culled without any further transmission. In Korea, ducks have been destroyed at the farm since quarantine officials detected the suspected low pathogenic H5N2 strain of avian influenza on December 1, 2004. In Japan, H5N2 virus was isolated or an anti-H5 antibody was identified from chickens in 40 chicken farms in Ibaraki Prefecture and in one chicken farm in Saitama Prefecture from June through December 2005. The strain was named as A/ chicken /Ibaraki/1/2005(H5N2). About 5.7 million birds were destroyed in Ibaraki following the H5N2 outbreaks. It was reported on November 12, 2005 that a falcon was found to have H5N2. In 2006, an H5N2 outbreak on a single farm in South Africa resulted in the destruction of all its sixty ostriches. The strain was similar to the one that caused outbreaks in South Africa 2004/2005. In 2007, a low-pathogenic strain of H5N2 was found in samples collected from 25,000 turkeys in West Virginia in a routine testing prior to their slaughter. The birds showed no sign of illness or mortality. Measures were taken to prevent the virus from mutating and spreading. In late 2007 (December 21), an H5N2 outbreak was found in the Dominican Republic. 15 roosters and 2 hens were eliminated even though they had no visible sign of infection. In May and June 2008, there were three outbreaks of low-pathogenic H5N2 avian flu in birds at three locations in the central, northern, and southern parts of Haiti. In Taiwan, outbreaks of H5N2 have been confirmed in December 2008. In 2015, an outbreak of H5N2 was identified in a series of chicken and turkey farming operations in the Midwestern region of the United States. As of 30 May, more than 43 million birds in 15 states had been destroyed as a result of the outbreak, including nearly 30 million in Iowa alone, the nation's largest egg producer. Japan's Health Ministry said in January, 2006 that poultry farm workers in Ibaraki prefecture may have been exposed to H5N2 (which was not previously known to infect humans) in 2005. Data were collected from 257 workers at 35 chicken farms by Ibaraki prefectural government. It was determined that their H5N2 antibody titers after the outbreak were significantly higher than those collected prior to the outbreak. ^ Kawaoka Y, Naeve CW, Webster RG (1984). "Is virulence of H5N2 influenza viruses in chickens associated with loss of carbohydrate from the hemagglutinin?". Virology 139: 303-16. ^ Horimoto T, Rivera E, et al (1995). "Origin and molecular changes associated with emergence of a highly pathogenic H5N2 influenza virus in Mexico". Virology 213: 223-30. ^ "Recommendations for Worker Protection and Use of Personal Protective Equipment (PPE) to Reduce Exposure to Highly Pathogenic Avian Influenza A H5 Viruses". www.cdc.gov. Retrieved 2015-07-31. ^ Okamatsu M, et al(2007). "Low pathogenicity H5N2 avian influenza outbreak in Japan during the 2005-2006". Vet Microbiol. 124: 35-46. ^  "South African ostrich industry hit hard by HPAI"
^  "Highly pathogenic avian influenza,Chinese Taipei"
^ Samantha Masunaga (30 May 2015). "Avian influenza epidemic spurs nationwide rise in egg prices". Los Angeles Times. Retrieved 1 June 2015. ^  article Dozens In Japan May Have Mild Bird Flu January 2006. ^ Ogata T, Yamazaki Y, Okabe N, Nakamura Y, Tashiro M, et al (July 2008). Human H5N2 Avian Influenza Infection in Japan and the Factors Associated with High H5N2-Neutralizing Antibody TiterJ Epidemiol 18: 160-6.